"Turn Up Your Speakers Now!" FULL-BODY-LICIOUS is a full body 5-day workout program consisting of intelligently designed 60-minute fat loss workouts to slim down or shape up. Each week cycles through five different full body workouts and each workout gives extra attention to key body parts that contribute to a flawless figure. By the end of the week you've hit all your major muscle groups five times with multiple angles, exercises and "advanced" fat burning techniques and tricks. Every single detail is based on strategy and science and a female's body structure. Each workout was carefully designed to 1) maximize metabolism 2) destroy fat and 3) reshape your muscles in the safest and most efficient manner. Each workout builds on the previous one and rooted in the proven F.O.R.C.E. formula just for females. It's up to you. I follow the 5-day program on a Monday, Tuesday, Wednesday, Friday and Saturday schedule. I take Thursdays and Sundays completely off and those are the days I usually indulge in my diet " guilt free " and let my body recover and reshape. I have been following the same workout for over 4 months now and my body is still changing from week to week. I recommend you give the program a full 12-16 weeks minimum to see the best results. I have no idea but I'm confident you'll see results faster than you have in the past! Most ladies drop anywhere from 1-2% of their body fat each week and continue to do so for at least 3-4 months before they need to change things up. Absolutely! I include a "home gym version" that you can print off and follow in the comfort of your own home. I would never make a fitness program that was subject to a gym that required fancy gym equipment. We'll build our bodies with good old-fashioned resistance that includes everything from benches, dumbbells, barbells, cables, stability balls, bands and our own bodyweight. I'll pass out dead if you find any aspect of my workouts boring or repetitive. Everything is fresh, stimulating and challenging. Q: What if I don't recognize an exercise? The entire workout program is VIDEO based so you get to watch me demonstrate every single exercise for multiple reps and I even include step-by-step instructions on how to perfect every exercise so you don't hurt yourself. It's like getting your own Personal Trainer! No! The entire program will become immediately available to you via download after your purchase - no shipping fees, no waiting for results! Everything can be downloaded to your computer once your order is processed successfully. Yes, and we know that because we've already had plenty of people in their 50's and 60's experience massive success while using the program. The program is crafted for any female of any age and any training background who is committed to making the most of their fitness and health. While I will say that the program is not "easy" in nature, you can modify any exercise, volume or intensity to adjust to your starting level. I provide ranges of sets and reps to shoot for so everything is relative to your fitness level. Definitely. In fact, I bet it'll make a lot of men gasp for air and make them burn. The program does not discriminate based on age, gender, or any other factor. The program is no walk in the park and lives up to my motto of, "You don't get a body like mine training like a girl!". It works across the board. I obviously had my husband Vince examine the workouts and he was extremely impressed with the science-based and strategic program design I utilized. It's not called a females formula to a flawless figure for nothing! Q: What if I don't see the results I want? 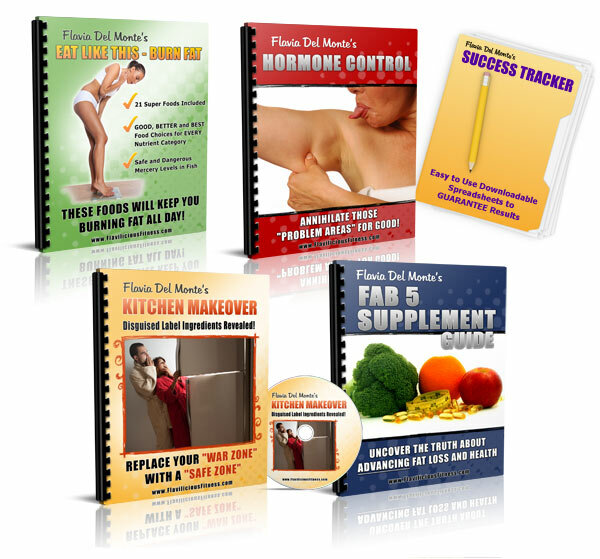 Simply put, if you follow the Full-Body-Licious 5-day program exactly as outlined in the DVDs, and do NOT lose more fat in the next 60 days than you ever have previously, just contact my customer support team and we'll refund every last penny. Like I said, I won't be able to sleep at night knowing you invested in my program and didn't see results, so I'll make things right and refund you no questions asked. As you can see, the pressure is completely on me to deliver you the results you deserve - all you need to do is give the program an honest shot and it'll work for you.